The special edition of the bulletin University Informative Voice is published in reference to the 16th memorial of genocide against Bosniacs in Srebrenica, UN safe area, in July 1995. This represents continuity in the activities of the Senate of the University of Sarajevo, which started in 2009. Numerous relevant sources published in scientific publications world wide speak about this gravest crime against humanity and international law. Numerous Judgments (of international and national character) were rendered, which among other things suggest the causes, objectives, and extent of genocide against Bosniacs of Bosnia and Herzegovina at the end of the 20th century. The international community is aware of the atrocities and aggression against Bosnia Herzegovina (1992-1995) and the genocide against Bosniaks. However, what has happened since then towards justice and to the Bosniaks themselves? At both the political and societal levels in Europe and in the U.S., the facts have been obscured and the picture of what happened has been manipulated to portray the scenario as a civil war and not as the genocide that occurred. 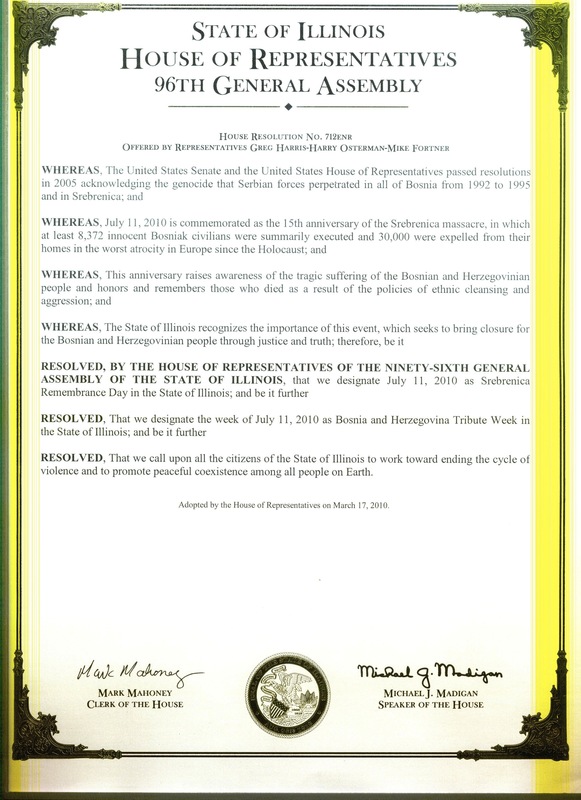 Among the American Bosnian community's victories is the recently passed State of Illinois' Resolution commemorating July 11, 2010 as the Remembrance of the Genocide of Srebrenica, where 8000 Muslim men and boys were executed on July 11, 1995. The issue of the relations between Bosnia and Bosniacs has to be considered from several aspects of those relations. First of them is the continuity of the name Bosnia and all the related names. Our science has not reliably identified the origin of the name of the state Bosnia, though that onomatology research and the topo-onomatology as its discipline approached the solution of this complex issue. In any case, this name is local and it emerged among its citizens who lived in the areas later known as Bosnia, which name will later on be used in the highest-level international documents as the marking for this state. But, there is no need to engage in the matter of etymology an the origin of the name, and instead it is necessary to consider the scientific facts which serve as the basis of the postulates for the consideration of these big historic, social, and political issues, which did confirm that around the mid 10th century around the source and in the upper flow of the river Bosnia and the surrounding regions, there was a state of Bosnia and its residents known as Bosnjani /int: Boshnian/. The conflict in Bosnia-Herzegovina, which began in April 1992 and ended in November 1995, has come to be seen as the model of wars of ethnic cleansing throughout the world. This was the most violent event Europe experience since World War II, and the devastation of the small multiethnic state recalled the ruins of Germany after the Allied bombing. The methods of ethnic cleansing, used for conquest of territory were a repudiation of the lessons of World War II as codified in the Geneva Conventions. Practically the only saving grace in Western policy making during the three-and-a-half-year war was the decision to launch an international war crimes tribunal to indict and try some of those responsible. How mass media propaganda impacts on ordinary people’s acceptance and participation in collective violence, and how Seselj’s nationalist propaganda promoted and justified coercion and violence by the Serbs against non-Serbs.